Instagram is a social photo and video sharing service that allows users to share and edit their own content. The number of monthly active Instagram users worldwide reached 600 million in December 2016. 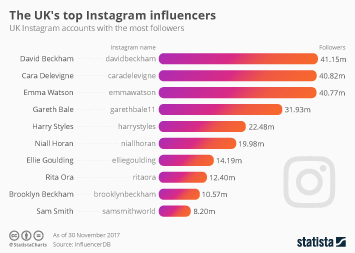 Russia, Turkey and the United Kingdom are among the top five countries with the most Instagram users. Instagram reached 22 percent of the UK population in the second quarter of 2016. In terms of age distribution among British Instagram users, they are predominantly young and more likely to be female. Roughly 55 percent are between 15 and 24 years of age. Of the entire population, 13 percent stated that they used Instagram daily or even multiple times a day. Instagram use in the UK is more common in higher income households. Other European countries show similar user profiles. Figures on Instagram use in Sweden by age group confirm it is much more widespread among younger audiences than among older ones. Data from neighboring countries shows a different case. The share of Instagram users in Norway grew in all age groups in 2016, except for the youngest. Regardless of the age of respondents, the share of female Instagram users in Norway is generally higher. The Netherlands show slightly different figures, here the share of Instagram users grew in all age groups. Usage frequency in different European countries also mirrors the data for the United Kingdom. Over 30 percent of Instagram users in Finland use the platform several times a day. The same is true for Instagram users in Denmark. An example of what users do most often on Instagram: Flemish users in Belgium commonly use the photo sharing service to consume content.